Δελτίο τύπου: «Hot on the heels of the success of their last record, "The Missing Peace", L.A. 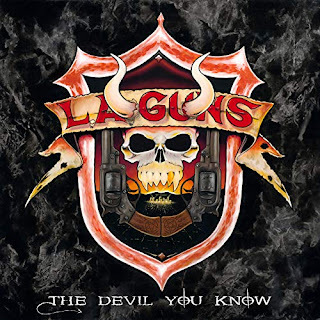 GUNS is ready to attack again with the new album, "The Devil You Know”. "After the success of 'The Missing Peace' a lot of people requested that the next record stay on track with the more metal side of the band's music, which is my personal favorite side of the band," says TRACII GUNS. He continues, "I drew from my typical influences of NWOBHM [New Wave Of British Heavy Metal], while still not forgetting my earlier influences of the late '60s and early '70s. I wanted to lead with the track "Stay Away" because it’s a familiar L.A. Guns sound, but even a bit more metal. Something to get everyone’s palate wet." Video: "The Devil You Know"
Album: "The Devil You Know"